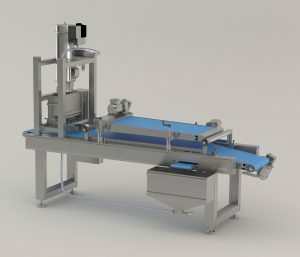 Introducing the latest generation Deco Seeder inline moulded product enrober. The Deco Seeder offers significant labor savings with minimal topping waste and excellent uniformity of topping. Stainless steel construction with FDA food grade blue belts. Extended top moulding belt that guides the seeded product over the seed reclaim gap between the moulding belt and discharge conveyor. Teflon coated adjustable side guides. Excess topping is transported via a cross conveyor back to a bulk seed collection bin. A compact venturi type automatic vacuum topping reclaim system provides fresh and reclaim topping to the topping depositing hopper. The Deco Seeder is designed to be used in conjunction with the Gemini/W&P line of sheeter/moulders but can be retrofitted to most moulders.